A Russian assassin. She made her first kill at the age of 10. After training under Simon and Dennis, she was employed in a weapon dealing organization led by Lingerin Douglanikov and his collaborator, her father Dracon. Her name is the Russian word for "crow". She escaped to Japan with a truckload of illegal weapons taken from Lingerin and Dracon. 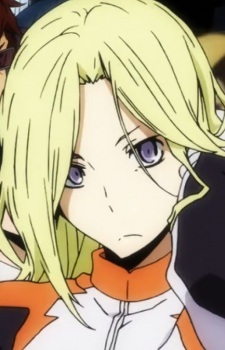 After a major conflict with Awakusu-kai and the Dollars business, she became a debt collector working with Shizuo. In this episode of Durarara! !x2 Ten, rumours fly around town that Shizuo has got himself a girlfriend. How will the true love of his life and soulmate, Tom, react to such shocking news?